Resi was recently approached to design a ground floor wraparound extension for a detached home in Dartford. 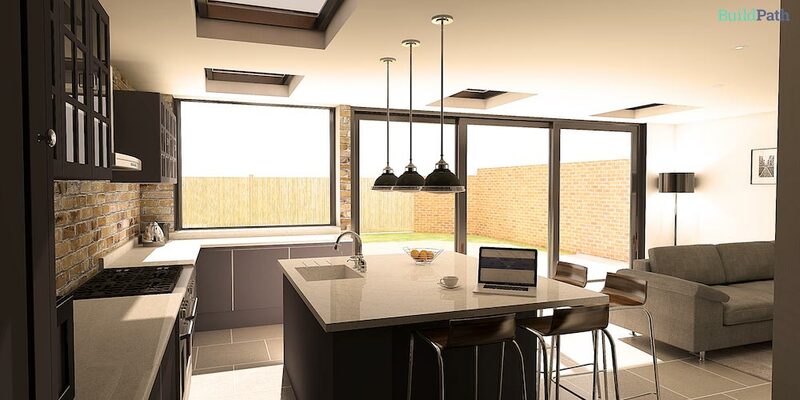 Lee wanted to maximise the value of his home by creating an open-plan kitchen, dining and entertaining space for his young family to enjoy together. This two-storey house is a great candidate for a wraparound rear extension. By taking only a small slice out of Lee’s garden and infilling the courtyard, this family could add a 24sqm extension...creating 45sqm of open plan living space. Lee came to me with plenty of thoughts about what he wanted to achieve, which I then helped to refine into useable plans. We agreed that our design priorities were creating a feeling of openness and space, and making the most of the view to the garden. Drawing inspiration from contemporary, Scandinavian-inspired design, Lee uploaded a few of his favourite images to our platform, whilst we discussed all of these requirements in more detail. Lee opted for our Concept Package and our 3D Visualisation Package. After a thorough briefing and drafting up the existing floor plans, I put together an initial design in 72 hours and pinged it over to Lee for review. Lee had decided that he wanted the interiors to include segmented glass-fronted cabinets and a raw brick wall, creating bold, structured lines and giving the space a modern-yet-timeless feel. To reflect this, I suggested that he consider a set of elegant steel Crittall windows. An interesting window can be great way to add some texture and depth to your space (and doesn’t show up as many marks from little hands!). On the outside, Lee was keen to include zinc and dark metal materials as cladding. He wanted his extension to feel complimentary to original house, rather than just a continuation of the existing design. I advised Lee that this particular combination would look very harsh alongside the red brick. Instead, I proposed a softer alternative that still fit Lee's vision: a charred timber wall with a zinc border. Maintaining a fluidity between indoor and outdoor spaces was a priority for Lee and his family, who love to socialise in their garden, so the segmented windows were ultimately set aside for larger, clear panes. To really emphasise this seamless transition, I suggested the interior tiled floor be extended out into the patio. Although Lee was happy, it wasn't quite perfect yet. I decided to sneakily generate one more render using a Rockpanel cladding with a timber frame, instead of the seamed zinc. This lighter grey gave a gentler and less industrial feel, and Lee loved it. Et voilà! A beautiful, light and airy open-plan kitchen to share with family and friends. Want to explore this space further? View the interactive model here. If you’re looking for floor plans, elevations or 3D renders with a 72 hour turnaround, schedule a call today.